There are things we can control, things we can influence, and things we can’t control. As we age, our hair is all of these. The importance hair plays in our self-image is reflected in the thousands of hair products currently on the market. In 1882, Fletcher Sutherland revolutionized the industry with his claim to cure baldness. Reverend Sutherland, a music composer, became known as the father of the “Seven Wonders.” His daughters were considered musical prodigies. Dora, Isabella, Victoria, Naomi, Grace, Sarah and Mary sang at the Atlanta Exposition in Georgia, traveled with the Colossal Shows and joined “Barnum and Bailey’s Greatest Show on Earth” in 1884. Surprisingly, when the Seven Sutherland Sisters became world famous, it was not for their musical talent, but for their hair. A New York paper reported, “Broadway gaped when the sisters trailed across the gas-lit stage and swung about to shake out their billowing tresses to a concerted gasp.” Blessed with crowning glories, these sisters had a collective hair length of 37 feet. When Fletcher Sutherland realized his daughters’ long hair was a greater attraction than their musical ability, he created the Seven Sutherland Sisters’ Hair Grower. He reasoned if grain and grasses grew strong with fertilizers, why not hair? With his guarantee that the solution could cure baldness and produce thick, luxurious hair, it became one of the most successful snake oil tonics of all time. A chemical analysis revealed the tonic contained 56 percent water of witch hazel, 44 percent bay rum, salt and hydrochloric acid, hardly capable of creating new hair growth. However, the sisters netted $90,000 the first year, selling the tonic for a dollar a bottle. Over a 38-year period, the Sutherland family brought in more than $2.75 million selling hair products. The Sutherland sisters lived an elegant lifestyle in a mansion they built in New York, with personal maids to care for their hair. Their lives were entwined with their hair, weaving tales of success, heartbreak and poverty. Sarah, the oldest sister, born in 1846, was considered the most sensible of the girls, and took over the business after her father’s death in 1888. She was often photographed seated so her three-foot long hair would appear longer. Although she was one of the wealthiest women at the time, she died of poor health and poverty at the age of 73. The second sister, Victoria, had seven-foot long hair, the color of a “raven’s wing.” She was once offered $2,500 to cut her hair but refused. She later sold one strand to a jeweler who suspended it in his shop window with a seven carat diamond at the end. Considered to be the most beautiful of the sisters, Victoria horrified her family when at the age of 50; she married a 19-year-old man. She only lived another three years. Isabella’s hair was six-feet long. It was rumored her mother was actually her father’s sister-in-law, as she was listed as “adopted” in the Census. At the age of 46, she married Frederick, a 27-year old man reportedly in love with her sister Dora. Known as a famous pistol shooter, he often sat on the veranda playing with his gun. One day as he was shooting out the spokes of a farmer’s buggy parked nearby, he turned the gun on himself and died instantly. It was reported that Isabella kept his body in the home for 10 days until she was forced to release it. Naomi began singing with her sisters at the age of 12 and was sent to Europe to develop her marvelous bass voice. She met and married Henry Bailey while traveling with Barnum and Bailey’s Circus. They had four children before she died of an illness at 35. Grace’s auburn hair was five-feet long. Although she never married, she raised Naomi’s children after her sister died. In 1924, Grace, Mary and Dora moved to California, where Dora was hit and killed by a car while crossing the street. Grace and Mary returned penniless to the Sutherland Mansion in 1930. Grace lived to be 92. In their lifetime, people believed long, heavy hair robbed the brain of nourishment and led to insanity. Mary, the youngest of the sisters, was considered mentally ill. It was reported that her family locked her in the bedroom when she suffered “spells.” Mary lived in the Sutherland Mansion for most of her life but eventually was committed to the State Institution for the Insane, where she died at 93. Fletcher Sutherland died in 1888, and two of his daughters, Naomi and Victoria, were deceased by 1912. That, however, did not stop the sales of the Seven Sutherland Sisters Hair Grower. The remaining five daughters and Henry Bailey recruited two “sisters” and continued traveling and selling their products. The tonic was still being advertised in 1930, although the business was declining. Reverend Sutherland would be amazed at the volume of hair products on the market today. One hundred and thirty-three years have passed since Fletcher claimed to have solved all hair problems; however, hair loss continues to be a major concern. Men spend more than $800 million a year for hair transplants. And medical therapies (including Rogaine, Propecia and other brands) add up to $225 million annually. The Sutherland Sisters might be pleased to know the sale of hair products in the United States rose to $11.6 billion in 2014, and the average woman spends up to $44,300 for hair products in her lifetime. Advertisers continue to seduce and sell the dream of thick, luxurious hair while consumers still seek products to control and influence their hair. Jan Rich is a freelance writer from Lakewood. She has written previously for Senior Scene. 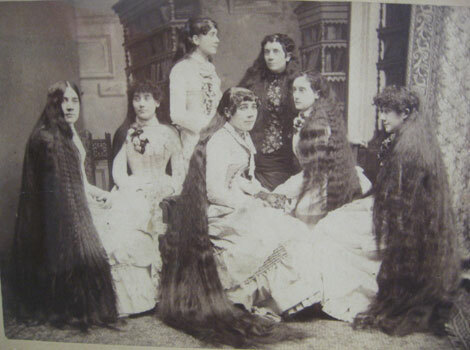 The Sutherland sisters, known in the 1880s as the “Seven Wonders” for their musical talents, ultimately became world-famous for their combined 37 feet of hair and the family’s baldness “cure” that did nearly $3 million in sales. Log in | 49 queries. 2.400 seconds.